Always think safety. That’s the message for every farmer these days. Too many accidents and deaths are happening on our farms and many of these are avoidable. Simple human error is a huge factor in the number of farm accidents in Ireland – the operator forgot something, took a shortcut or a risk, ignored a warning, was not paying close attention, failed to follow safety rules or did not maintain the machine in a safe condition. There are many different kinds of farm machinery – mowers, tractors, harvesters, augers, slurry spreaders, balers etc. but they all have similar characteristics and similar hazards. 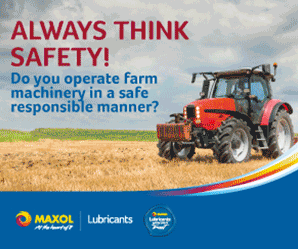 Do you operate farm machinery in a safe responsible manner? We want you to come to the Maxol stand at the Ploughing Championships. We are on Block 3, Row 22, Stand 482. Come and test your skills on our Agri Simulator. Prove that you are safe and responsible when operating farm machinery.